PowerPoint can count the number of words that are in a presentation and also provide information such as the presentation format and the number of slides, notes, hidden slides, and multimedia clips. Which version of PowerPoint on a PC are you using? On the File tab, click Info. At the bottom of the rightmost pane, click Show All Properties. The Words property counts all the text on slides and notes pages. 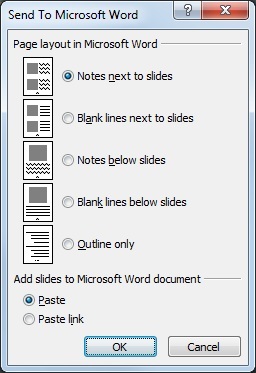 You can also count only the words in your PowerPoint presentation’s notes pages, but its best to do so in Word. On the File tab, click Export > Create Handouts. 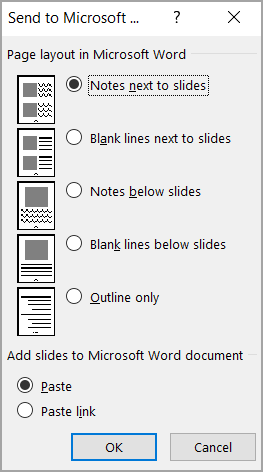 The presentation opens as a Word document in a new window. You can edit, print, or save as with any Word document. Word automatically counts the number of pages and words in your document and displays them on the status bar at the bottom of the workspace. If you don't see the word count in the status bar, right-click the status bar, then and click Word Count. Click the File tab, and then in the leftmost pane, click Info. You can also count only the words in your PowerPoint 2010 presentation’s notes pages, but its best to do so in Microsoft Word. Click the File tab, and then in the leftmost pane, click Save & Send. In the middle pane, under File Types, click Create Handouts. In the rightmost pane, click Create Handouts. In the Document Information Panel, click the arrow next to Document Properties to select the set of properties that you want to view, and then click Advanced Properties. You can also count only the words in your PowerPoint 2007 presentation’s notes pages, but its best to do so in Microsoft Word. Click File > Properties, and then click Statistics. 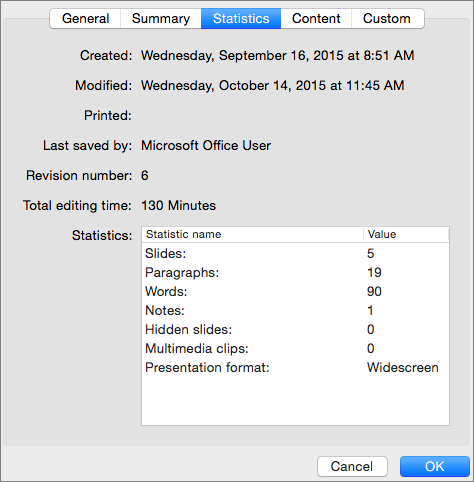 Tip: PowerPoint includes punctuation in word counts, so your count may seem higher than you expect. PowerPoint Online doesn't have word-count information. You have to use a desktop version of PowerPoint to see the word count.